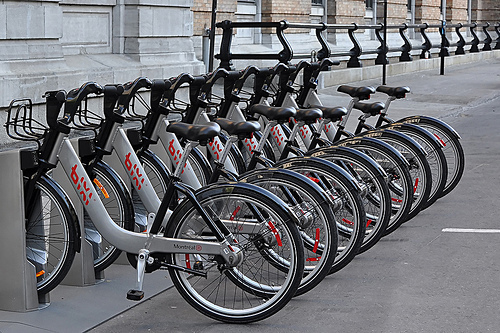 In Montreal, the presence of bike sharing stations has contributed to an average increase of 2.7 per cent in sales price of houses nearby, says a new study by McGill researchers. We know that an extra bedroom, and a metro station nearby will make your house more valuable. Now it turns out that a bike-sharing station nearby will do the same. Researchers at McGill studied house sales in central Montreal before and after the Bixi bike sharing system was launched in Montreal in 2009. They found that a typical home in the central Montreal area they studied had about 12 Bixi stations nearby, which had increased its value by 2.7 per cent – or $8,650 on average. The team arrived at these conclusions by looking at the Multiple Listings Service (MLS) database of all home sales in most of the island of Montreal from 1996 to 2012. They focussed on 2400 units that were sold more than once during this period, in order to study the increase in values. Once they had filtered out other factors they found that each bike-sharing station in the neighbourhood lead to a $700 increase in property values for the nearby houses. It is likely that other cities with similar bike sharing systems, like New York, Toronto, or Paris, will see similar effects on housing prices. “We expect studies on other cities will also find a positive impact on house sales,” El-Geneidy says.